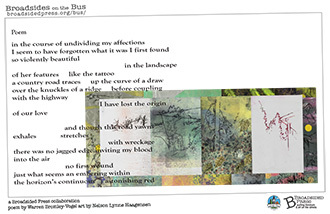 Broadsides on the Bus, 2014 Moscow, Idaho Local artists and writers originally created these works as part of this year’s Ecology of Desire Creative Currents project in which—like an artistic game of telephone—each artist created a piece based off the piece created before them. The broadsides that combine these works are designed by local designer and MAC member Mario Montes. During the month of June, they rode the buses of Moscow.